Naples is the largest city in southern Italy. It is located in the Campania region. It is famous today, and maybe for 4000 years, for its lovely people whose city is bustling, lively, and chaotic. Naples is the oldest continually inhabited city in the world, having been founded during the Neolithic period. Naples’ history is long and varied. First settled by the ancient Greeks during the Magna Grecia, successive peoples have built their lives and culture literally right on top of one another. Below is a map of Naples sightseeing highlights. You can use the toggle button to display the museums and points of interest. The Naples National Archaeological Museum (Museo Archeologico Nazionale di Napoli) is a museum in Naples, at the northwest corner of the original Greek wall of the city of Neapolis. The museum contains a large collection of Roman artifacts from Pompeii, Stabiae and Herculaneum. The collection includes works of the highest quality produced in Greek, Roman and Renaissance times. It is the most important Italian archaeological museum. The museum has the third largest collection of Egyptian artifacts in Italy, after the Vatican Museum and the Museo Egizio in Turin. It is made up primarily of works from two private collections, assembled by Cardinal Borgia in the second half of the 18th century, and Picchianti in the first years of the 19th. In the recent rearrangement of the galleries the two nuclei have been exhibited separately, while in the connecting room other items are on display, including Egyptian and “pseudo-Egyptian” artifacts from Pompeii and other Campanian sites. In its new layout the collection provides both an important record of Egyptian civilization from the Old Kingdom (2700-2200 B.C.) up to the Ptolemaic-Roman era. Artifacts from the Magna Grecia period, and Ancient Roman pieces from Pompeii and Herculaneum, among other local sites, are highlights of the collection. All these local artifacts are very well preserved because Mt. Vesuviuss volcanic ash covered and preserved priceless works of art. These provide incredible insight into life thousands of years ago where western civilization was born. 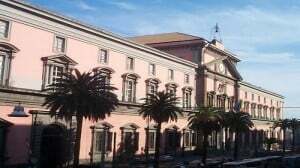 The Capodimonte Museum, the Palazzo Reale di Capodimonte, was intended originally as a hunting lodge for King Charles VII of Naples and Sicily, later Charles III of Spain. It grew into an art museum when Charles inherited the Farnese collection from his mother Elisabetta who was the last Farnese when she died in 1766. The museum includes work of art from the 13th to 18th centuries. It is the best collection of Neapolitan School of art. It also includes portraits of members of ruling families by Titian and formed the basis for the National Gallery (Galleria Nazionale), one of the finest and largest art collections in Italy, now housed here. Its more than 500 pictures include, in addition to the Titians, works by Mantegna, Caravaggio, Raphael, Botticelli, El Greco, Bellini, and Neapolitan artists of the 17th and 18th centuries. In the royal apartments, you’ll find furniture, tapestries, and porcelain used in the palace during the Bourbon and Savoy dynasties. The small room, Salottino di Porcellana, is completely lined with porcelain. In the park that surrounds the palace, which was the royal hunting grounds, King Charles III founded the Capodimonte workshops to produce ceramics. This highly decorative work became quite famous, and you’ll see products of the workshop at the convent Santa Chiara. Wander in the beautiful park, along avenues shaded by huge trees, past battered statues and a pond. Inside the Castel Ovo is an Ethno-Prehistory Museum with ceramics and other artifacts from ancient Naples. There is no charge for admission to the castle and museum. A church located at the precise geographic center of the historic center of the ancient Greek-Roman city, San Lorenzo Maggiore at the intersection of via San Gregorio Armeno and via dei Tribunali. The name “San Lorenzo” may also refer to the museum now opened on the premises, as well as to the Roman archaeological site beneath the church itself. The church’s origins derive from the presence of the Franciscan order in Naples during the lifetime of St. Francis of Assisi, himself. The site of the present church was to compensate the order for the loss of their earlier church on the grounds where Charles I of Anjou decided to build his new fortress, the Maschio Angioino in the late 13th century. The museum takes up the three floors above the courtyard and is given over to the entire history of the area that centers on San Lorenzo, beginning with classical archaeology and progressing to a chart display of historical shipping routes from Naples throughout Magna Grecia and the Roman Empire. The museum provides a detailed account of the local “city hall” that was demolished in order to put up the church in the 13th century and continues up past the Angevin period and into more recent history. Beneath San Lorenzo, about half of an original Roman market has been excavated. The site has been open since 1992, the result of 25 years of painstaking excavation. The market place is the only large-scale Greek-Roman site excavated in the downtown area. In this church Boccaccio meet his beloved Fiammetta (1338). The Catacombs of San Gennaro are underground paleo-Christian burial and worship sites in Naples, Italy, carved out of tuff, a porous stone. They are situated in the northern part of the city, on the slope leading up to Capodimonte, consisting of two levels, San Gennaro Superiore, and San Gennaro Inferiore. There you’ll find a huge underground burial site along with burial place of San Gennaro, the patron saint of Naples. If you look further you’ll discover one of the oldest churches in all Catholicism. Tiny street in the center of bustling Naples where the stores and workshops of local artisans who practice their art and craft of creating the famous Naples nativity scenes. 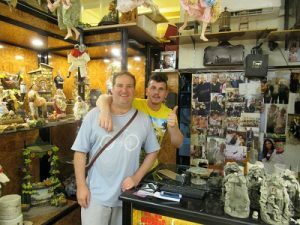 Here you’ll find shops full of the Neapolitan Creche and artisans practicing the art of presepio. Presepio are finely crafted miniature works of art, the entire range of emotions spring from the faces, the eyes and the gestures of these spectacular miniature replicas of Neapolitan life. Each piece capturing a part of the Neapolitan spirit, each scene recording 18th century life in Naples. The scenes mix the sacred and the profane, setting the Holy Family and the procession of the Magi alongside vignettes that portrayed contemporary life in 18th century Naples. Scenes that depict ordinary people going about their ordinary lives: shoemakers and innkeepers, bakers and fruit vendors, fishmongers and butchers, carpenters and blacksmiths, and the beggars, the poor and the derelict. Today, the Neapolitan Presepio or Presepe, o’Presebbio in dialect, is probably Naples most widely known Christmas tradition and the art of the craft is world renowned. Driving along the Naples waterfront on the scenic Via Partenope you’ll pass the Castel dell’Ovo, a castle built on the site where 2600 years ago the ancient Greeks in the 6th century BC founded the city. It is the oldest foundation in the city. The Castel dell’Ovo was built by the Normans in the 12th century and as it stands to day by the Aragonese in the 15th century. According to legend Virgil placed his magic egg in the foundation, from which its name is derived. Today you can wander out and you’ll find a few restaurants and bars next door. During the summer months you’ll found the local Napoletani swimming and taking the sun around the castle’s walls. 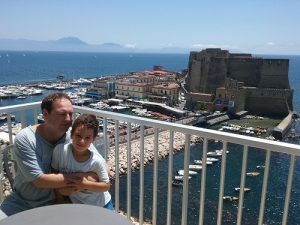 In addition to Castel dell’Ovo several other large castles and edifices remain in Naples from long ago, such as King Charles III’s former hunting lodge aka The King of Two Sicily’s. It is now the Capodimonte museum, complete with both paintings and porcelain collections. Castel Maschio Angioino, also known as Castel Nuovo, was built originally in the 1200s. It has been renovated several times through the centuries and has served as an important location for functions of high-ranking individuals. This piazza, seen above, nestles between the royal palace and the church of San Francesco di Paola. 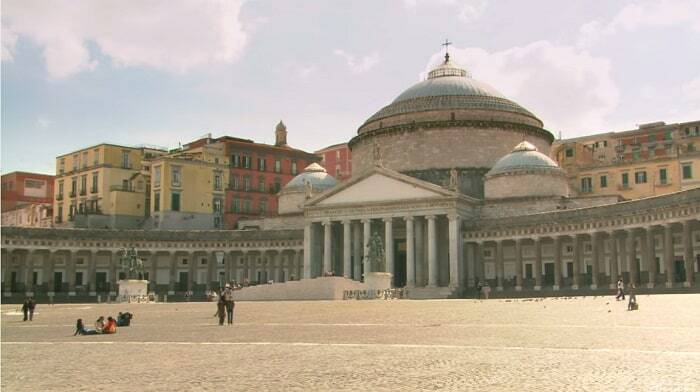 It is the public square and pedestrian space in the center of Naples. Posillipo Hill is one of those consistently beautiful high views over the Bay of Naples. It is also known as a spot for lovers to feel romantic. For pizza check out Pizzeria 50 Kalò. It’s a nice walk along the water from Piazza Vittoria toward Piazza Sannazzaro in the Mergellina neighborhood. Another classic is Antica Pizzeria da Michele. Lombardi off Via Cavour and Via Duomo serves more than pizza and is a classic. Another pizzeria close by the Duomo and Naples Archaeology Museum is Di Matteo. Brandi Pizzeria is where the first Pizza Margherita was served to Italy’s Queen Margherita in 1867. Using local ingredients of basil, mozzarella and tomato to create the colors of the Italian flag on the pizza. Espresso in the morning go to Caffè Gambrinus. 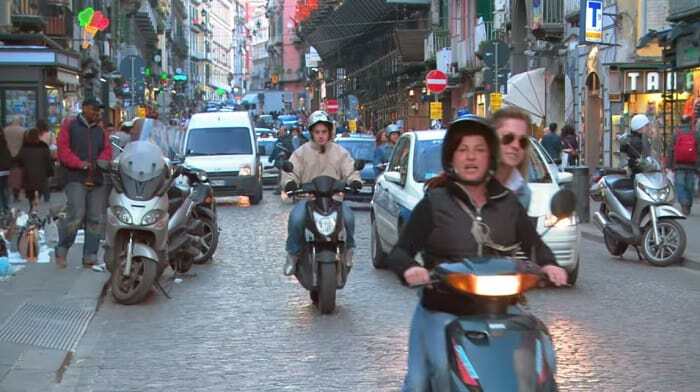 It is located at end of Via Chiaia across street from the Galleria and Naples Opera house. Big difference between price to sit down versus standing at the bar. If you decide to stand at bar pay the woman at cash register first then place receipt on the counter for coffee barista. Put a euro tip on top of the receipt. One of Naples many highlights is its network of thermal spas. The entire area is volcanic. Mt. Vesuvius towers over the area. The Island of Ischia off the coast of Naples is full springs and wells that provide relief for all types of illnesses. On the mainland around Naples there are spas in Agnano Terme, Bacoli, Torre Annunziata, and Vico Equense, along with the other well-known resorts such as Castellammare di Stabia. Pozzuoli, in the center of the wide volcanic area of the Phlegraean Fields, was already known to the Romans, who used the sulfurous mud for healing purposes. The waters and mud of Pozzuoli are used today in the treatment of respiratory and locomotive system disorders, and for skin complaints. The spa resort of Contursi is situated in the Salerno area, a few kilometers from the Cilento National Park; this resort also has very ancient origins and was frequented by the upper classes at the time of the Roman Empire. The waters are classified as sulfurous and salso-bicarbonate-alkaline-earthy, they are particularly recommended in chronic and degenerative inflammatory illnesses of the locomotive system. Further south in the Salerno area, lies the spa town of Montesano sulla Marcellana. There is another important resort, Telese, between Benevento and Caserta. The waters of Telese, too, have been known about since time immemorial. Their use dates back, in fact, to the Roman era. The waters here are very rich in mineral salts, carbon dioxide and hydrogen sulfide. Take a cruise around the Bay of Naples. The different shades of blue and green waters look like a scene in Homer’s Odyssey. The way the sun hits the white cliffs with multi-colored houses overlapping each other accenting the clear blue waters like pristine images from a postcard is unforgettable. Of all the beaches in the world it is hard to find one that compares to the beaches of the Amalfi Coast. The Royal Palace of Caserta is a former royal residence in Caserta, southern Italy, constructed for the Bourbon kings of Naples. It is one of the largest palaces erected in Europe during the 18th century. Today you may wander around the beautiful garden, which is over a mile long. Inside the palace is gorgeous. Paestum is located in southern Italy’s Campania region. It may be most famous as the origin of Mozzarella di Bufala, which is manufactured here from the milk of the Italian Mediterranean water buffalo. 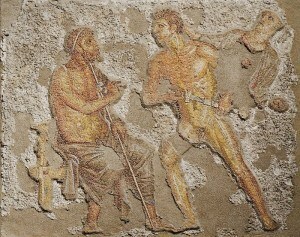 The area, like Naples, was founded by the ancient Greeks. There on hills overlooking the Tyrrhenian Sea, the ancient Greeks built Temples. Today these ancient Greek Doric Temples are among the best preserved in the entire world. For more information about visiting Paestum click here. Immortalized by the eruption of Mt. Vesuvious 60 years after Christ in the year 69 AD, in these two ancient Roman urban city centers you’ll find the ruins of life 2000 years ago on the Bay of Naples. An easy way to travel from Naples (Napoli) to Pompeii and Herculaneum is by the high speed express train Campania Express. This train departs four times daily around the Bay of Naples and includes stops in Herculaneum, Pompeii and Sorrento. Sorrento is a resort town on the north side of the Sorrentine Peninsula cliffs overlooking the Bay of Naples. it is the gateway to the Amalfi Coast. The Amalfi Coast is located on the south side of the Sorrentine Peninsula overlooking the Tyrrhenian Sea off the west coast of Italy. Known as a jet setters paradise, Capri’s main square is full of the finest made in Italy shopping boutiques. Its lovely walking paths provide vistas unique in the world for their beauty. Capri is a tiny island that becomes very crowded with tourists during the high summer season. What used to be primarily a fishing village includes 200 hotels. Today tourism flourishes. Castello Aragonese was built in the 15th century on a natural island about 100 meters off Ischia. The tower across from the island is where Michelangelo would meet one of the Royal family members who was married. With its crystal blue beaches and healing therapeutic water from its volcanic springs, all year round the thermal water is 60 to 100 degrees. Sorgeto Springs thermal water has health benefits that is excellent for skin conditions. Everyone should get an opportunity to visit Naples. Click here to customize your vacation to Naples, Sorrento, and the Amalfi Coast.